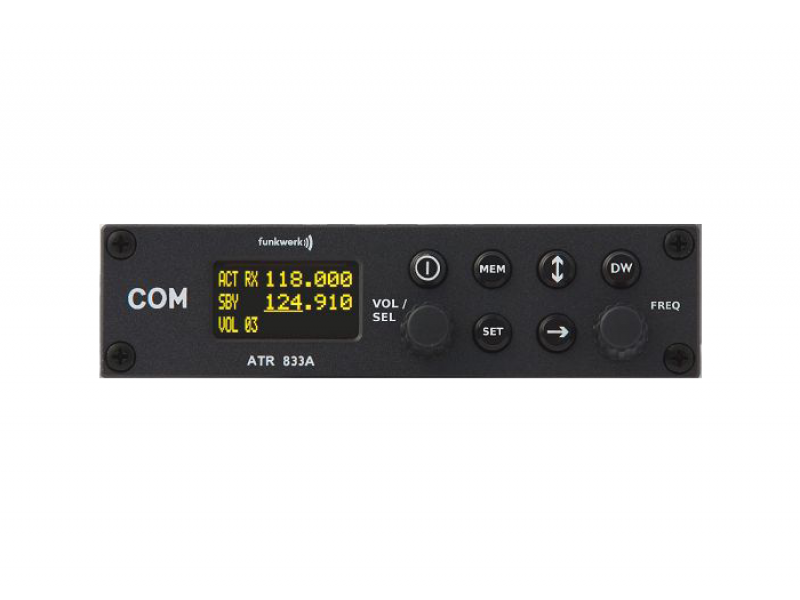 The ATR833A with yellow and black OLED-display in a 160mm housing is a complete solution for radios in small aircraft with the new channel separation of 8.33 kHz. The channel spacing can be switched between 25kHz and 8,33kHz. The built-in vox controlled intercom operates up to 4 microphones (2 standard, 2 dynamic). In many cases no extra intercom is required. This saves cost and weight. All headsets are separately adjustable. Using similar headsets a 4-place intercom can be built-up. In addition to the standard functions there are 2 memories available. The user can define up to 100 named frequencies to build up an own database. In addition the last 10 frequencies used can be recalled. All ATR833 radios can be fully remotely controlled by use of the remote unit ATR833RT. Light Aviation Pilot Shop is dealer in instrumenten en onderdelen voor lichte luchtvaartuigen en zweefvliegtuigen. In België, Nederland en Luxemburg is Light Aviation Pilot Shop van LXNAV de exclusieve vertegenwoordiger.